Born of a creative background, at w+r we are passionate about the alchemy of the concrete process, the transformation of the base materials into stunning features for the home and public spaces. 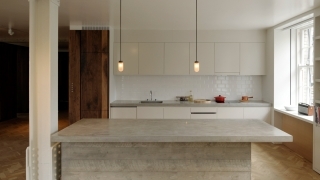 Formed in 2004 we have developed a solid and growing reputation for delivering high quality, bespoke, hand trowelled concrete countertops and architectural features. Fine art credentials inform the aesthetic and sculptural understanding of the concrete process. All of our work is cast in-situ. Each object is created in the environment it is designed for meaning that the construction process can respond to the nuances of an enviroinment in a way that pre-cast cannot. Formwork construction is made to measure and all concrete is expertly finished by hand. The advantage we offer by casting in-situ is join free seamless countertops of any size or shape that can incorporate any wall profile into the design. The versatility of this method allows the concrete to flow around any recess or wall projections, while the tactile finish creates a more organic and warmer result than the machined surface of a pre-cast concrete countertop. The surfaces are hand trowelled to a fine, lightly burnished finish, then sealed and waxed to give a smooth, warm and tactile surface. For further information, or to receive a quote please contact us.